When you’re working on a project or a solution, you don’t necessarily know what other people think of it. At least, not until they try it out, and tell you what they think. Well, we realized that we wanted to find out what people think about Zerynth. Rather than asking them, we decided to do a search online, and see what came up. It seemed more honest and current. It’s quite simple really, curiosity got the best of us. So, scroll through the post, and see what people have to say about Zerynth – why it’s useful, what its advantages are, and what they have used it for. Perhaps it will give you an idea, or a solution to a problem you have. Of course, we would love if you could share what you think about Zerynth online. Tag us on social media, and share your thoughts. First of all, let’s check out what some of our partners have to say about Zerynth. And what do people have to say about Zerynth on LinkedIn, the world’s largest social media platform for professionals? The first LinkedIn post is by Sundaresan Swaminathan, a Senior Architect of NXP. The second one is a comment by Eder Andrade. Let’s move to Twitter, the most fast-paced social media platform. You can see the comment here. Fun fact – the author of the comment is Stephen Borsay, the Udemy lecturer of the “Exploring AWS IoT” course, where Zerynth tools are used. The course teaches you about programming embedded devices and managing data in AWS IoT, so give it a try, if you have time. If you’re interested in sharing your thoughts on the Zerynth toolset on Twitter, use the #Zerynth, or tag us in your post. And what are the bloggers saying about Zerynth? The LeMaRive tech blog features a two-part tutorial about connecting the ESP32 to the Cloud. In the first part, Mauro, the author of the post, said a few words on why he finds Zerynth to be useful. 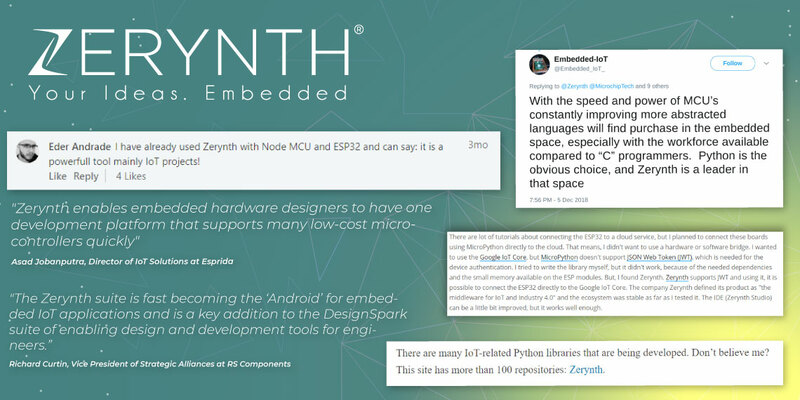 One user asked this question on Quora: Are Python implementations like Zerynth and Micropython gaining popularity in embedded systems market? The answer is pretty long, so we highlighted the Zerynth section for you in the image. You can read the full answer here. Lastly, we have a section of YouTube comments that speak about the effectiveness and usefulness of the Zerynth Ecosystem. You can see the original video here. The video talks about the rising popularity of Python, and ask the question is it time to move on from the Arduino IDE. Did you know that out of all programming languages Python is ranked first, by the EEE Spectrum’s fifth annual interactive ranking? Out of 47 programming languages commonly used today, Python is the most popular one, getting ahead of C, C++, and Java. You can read the full article here, and learn what everyone has to say about this. From magazines like the Economist to GitHub statistics reports, and trending blogs.